and for the first time I was laid low with a dodgy stomach. I couldn’t move. 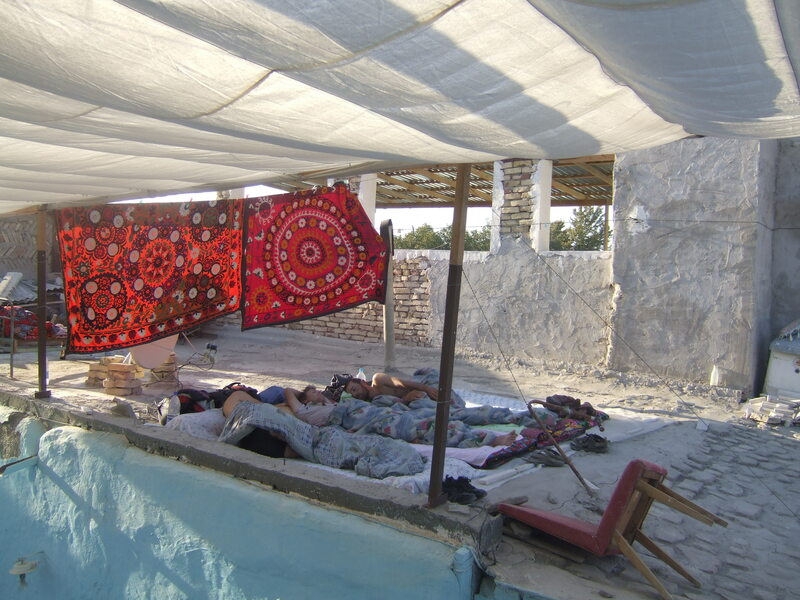 I spent the whole day lying on the bed of the guest house in 45 degrees heat with the fan on, blowing just hot air. I couldn’t sleep. I was just so bored. 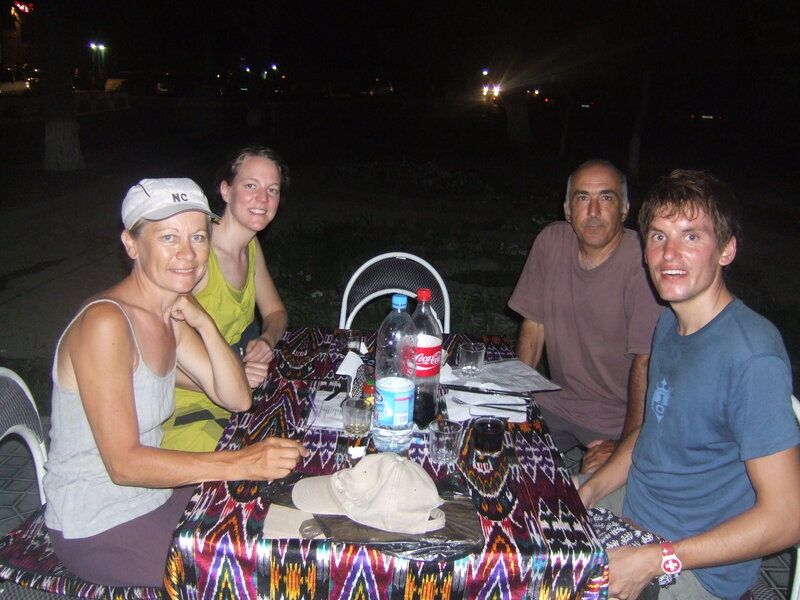 That evening I had to force myself to go to a restaurant for some dinner – Nino and I had pre-arranged to meet the French couple we had met with a camper van in the Turkmenistan desert and Mary Anne who was also French who we had met in the resturant the night before. I had a soup and then that was me. I was off. I was still feeling rough. The next day I was happy to be feeling much better. I took some rehydration sachets to rehydrate which helped a lot. I had lost a lot of fluid the previous day. Just sipping water is not enough. With the 3 Swedish guys and Nino we cycled around the main sights of Bukhara visiting some of the many beautiful Medressa. We did a lap of the Ark which is a high walled citadel that used to house the Royal family. One of the Medressa had been abandoned and was in ruins. We were able to climb up on to the roof. 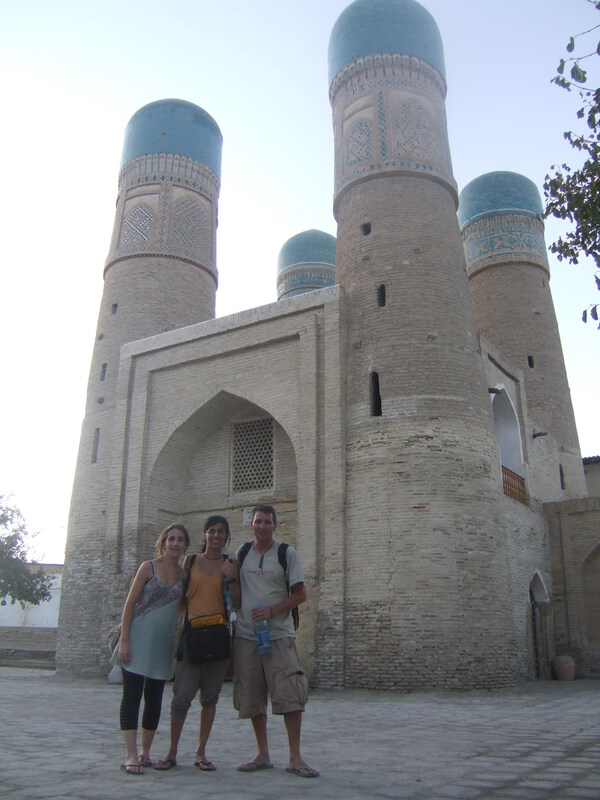 Bukhara has a lot of tourists. 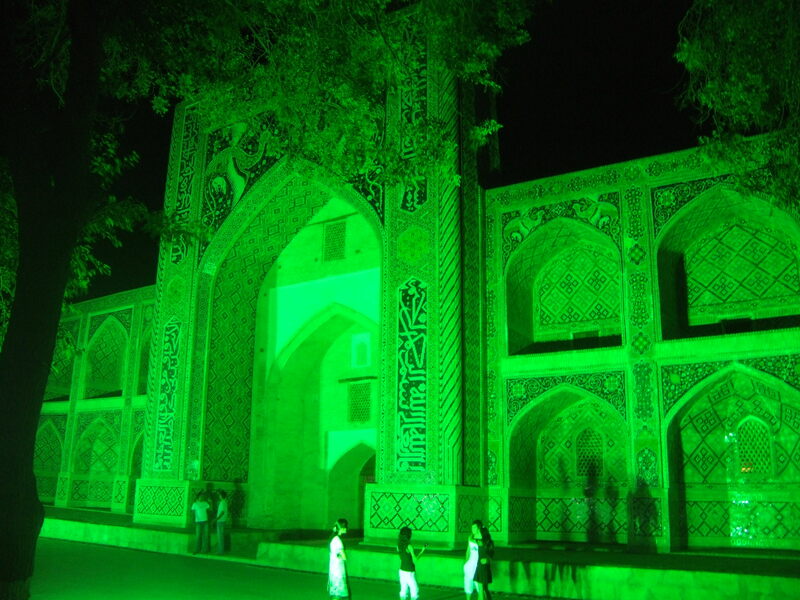 It is one of the nicest cities in Uzbekistan. It is a very old city. It was also very hot – middle of the day 45 in the shade and 55 in the sun. The power had a habit of going off every day for a few hours in the afternoon and you never knew if you would have water when you went to have a shower because that was prone to stop as well. The guedt house were kind enough to let us leave our bikes in the court yard of the guest house. to Tashkent for the sole purpose really to pick up a Chinese visa before returning to Bukhara and cycling to Tajikistan.We paid First class………..far from it. The train was very old. Had no air con. no fan either and the train was very hot. 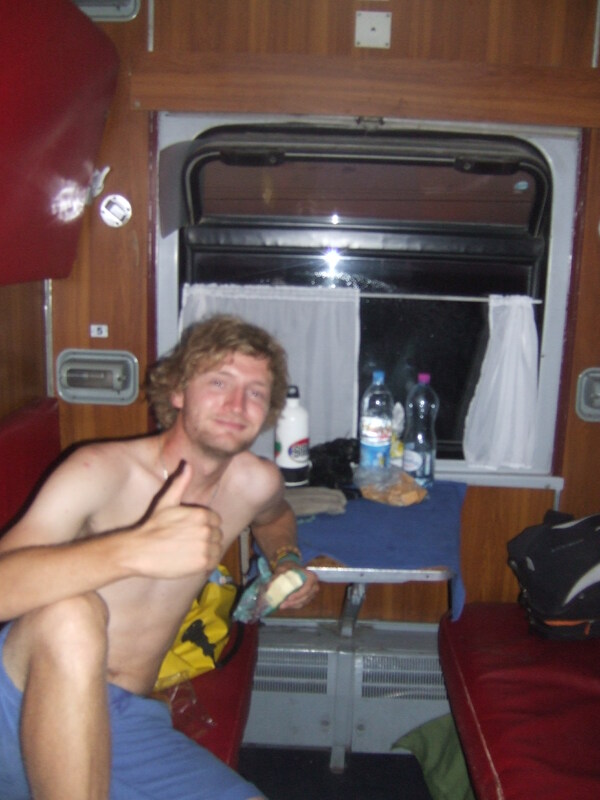 We were lucky that Jeremy and I had a 4 berth cabin to ourselves. So at least it was not too crowded. Arriving by train at 6:30 am, it wasn’t too hard to find the guest house Guerua. Which is a real haven for back packers and fellow cyclists. Was only 5 stops on the metro. 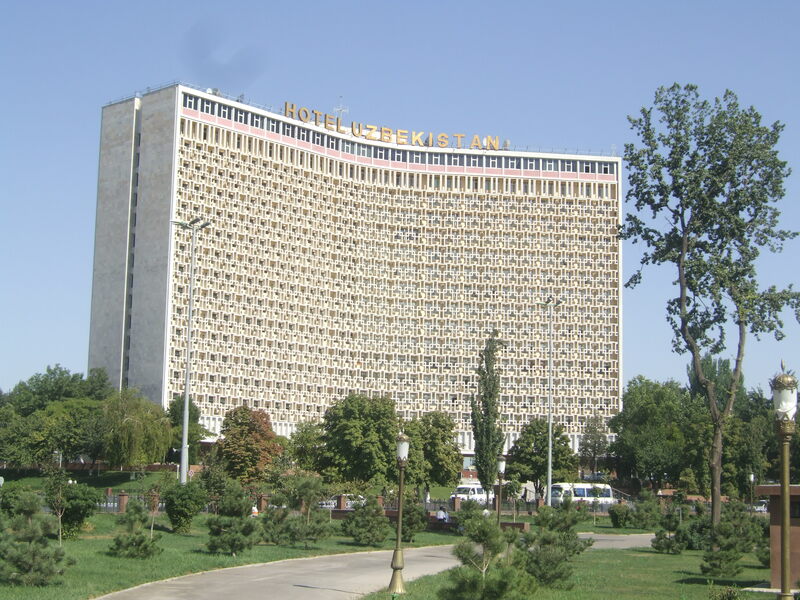 Tashkent is a very different city compared to Bukhara. It is the capital and a very new city because most of Tashkent was destroyed in a earthquake in 1968. It is a police state with police everywhere. You can hardly take photos. You are searched every time you go on the metro. There are plenty of parks……………..you just can’t sit on the grass. Facebook is back. But the BBC is blocked and so is this blog for some reason. After checking in to the guest house I spent the rest of the day looking for a cash machine. which turned out to be fruitless because after visiting 3 hotels none of them worked and the rest of the day was wasted trying to find a decent bike shop so I could get some spare inner tubes. That also turned out to be unsuccessful. a group of 5 of us from the guest house (all cyclists) went to the Chinese Embassy to apply for the visa. Had planned to get there early. Problem was finding a taxi that knew where it was. We ended up driving round in circles and when we finally got there there was a long queue. 2 hours later we finally got into the embassy. I tried applying for the visa with my New Zealand passport…..as usual I was told I would have to apply with my British passport ………..which is costing me a fortune for visas. We paid US$ 100.00 for the one day service. So returning at 5pm to pick up the visa turned out to be a productive day as I had heard China was one of the visas you could have trouble with. While we were there a French guy got thrown out of the embassy because France has recently hosted the Dali Lama and was told he would have to go through a travel agent………..the visa itself is US$ 180.00 for French citizens. much needed fresh fruit and nuts. I have still been feeling rough the last few days. I need to eat a bit more healthier. The temperature dropped a bit as well (probably 38 degrees instead of 48 degrees). So it has been fine to walk around in the middle of the day. In the Bazaar was a special window where the locals could get alcohol. They buy the cheap clear stuff that comes out of an old coke bottle and get hammered. Little sign of Ramadan here. 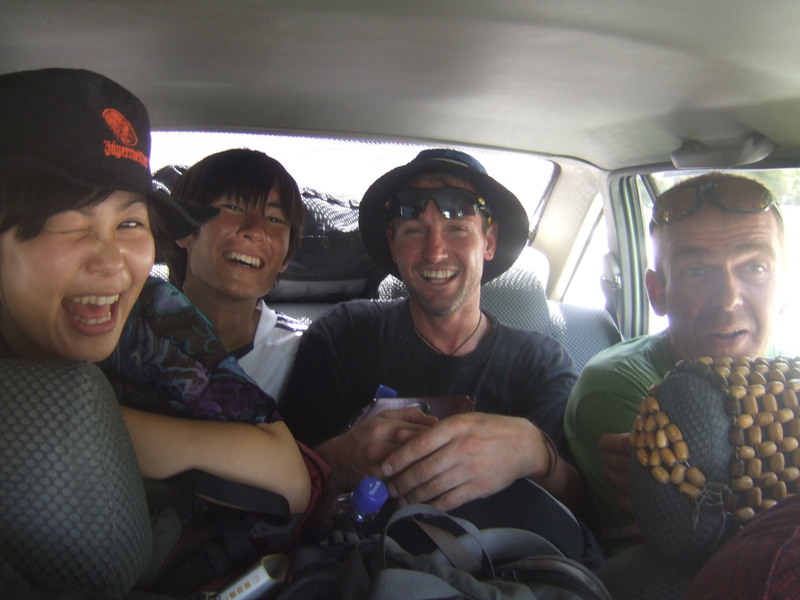 Mission complete (China visa obtained) – 5 of us and one bicycle got a shared taxi the 300 km/3 ½ hour trip to Samarkand. It was pretty cramped with 4 of us in the back with bags as well. We were fairly tired when we arrived at the guest house and ……..bad news it was fully booked. The place was full of cyclists. Luckily for us Philip and Fred had left their bikes there so they found some room for us sleeping outside on the chaptan. With the promise of a room tomorrow. 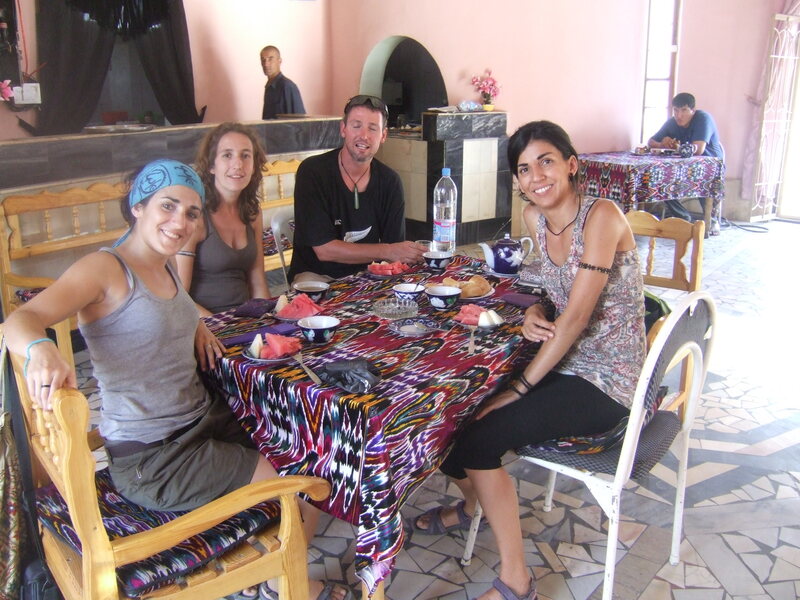 Mid-morning I finally got myself out of the guest house………and as recommended by Meliane headed to Guri Amir Mausoleum. which had many impressive tombs built on a hill beside the cemetery. Since I visited the cemetery first I entered from the back and only discovered that you had to pay when I walked out the front. In the afternoon I visited the major tourist attraction in Samarkand the Registan with its massive Medressas. 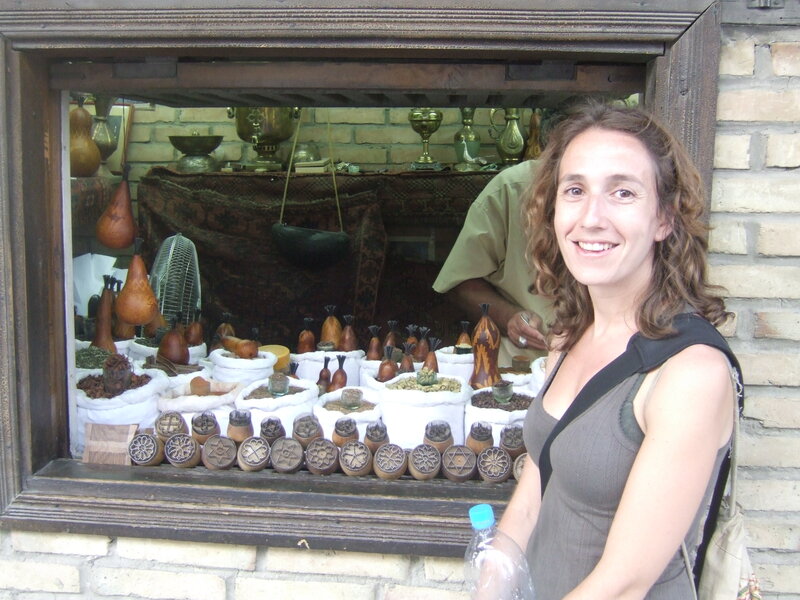 Locals pay 600………tourists pay 12000. was nice…….but every room of the Medressa had a shop. I was sharing with went out to the chemist for me and came back with some medication, which seemed to do the trick. I was supposed to meet Nino the Swiss cyclist I had cycled with from Mashhad. He was going to give me some spare inner tubes his mum had brought over from Switzerland. Instead his mum turned up to drop off the inner tubes because Nino was also very sick and the doctor had had to come in the night and he had been put on a drip. Another cyclist turned up in the hostel today and I have plenty of admiration for her. 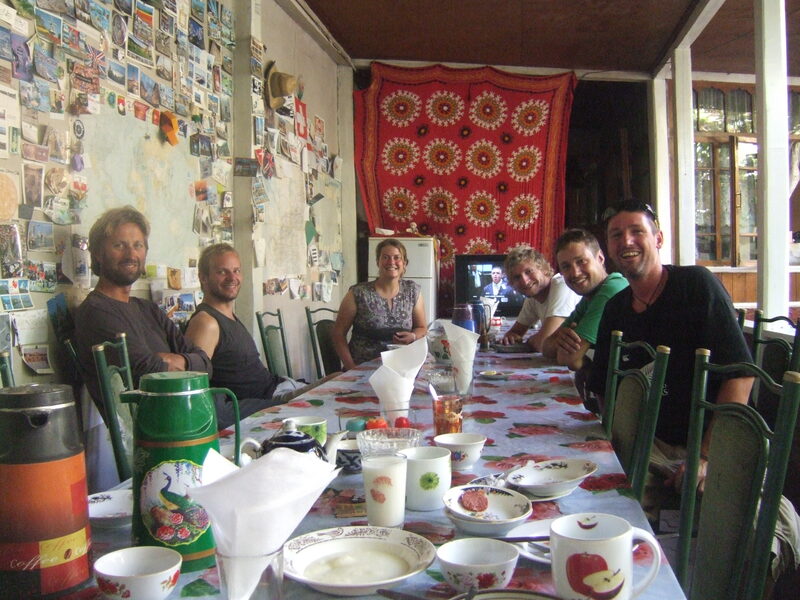 She was from Belgium and had cycled the past 9 months From New Zealand to Uzbekistan. Thankfully I was better today and got myself on the afternoon train back to Bukhara. entertainment ( TVs in each carriage) Plenty of leg room and reclining seats. Got the Marshruka into the old town and as soon as I arrived I bumped straight into the Spanish girls I had met in Samarkand, which was great. They were having a bit of dinner so I joined them. 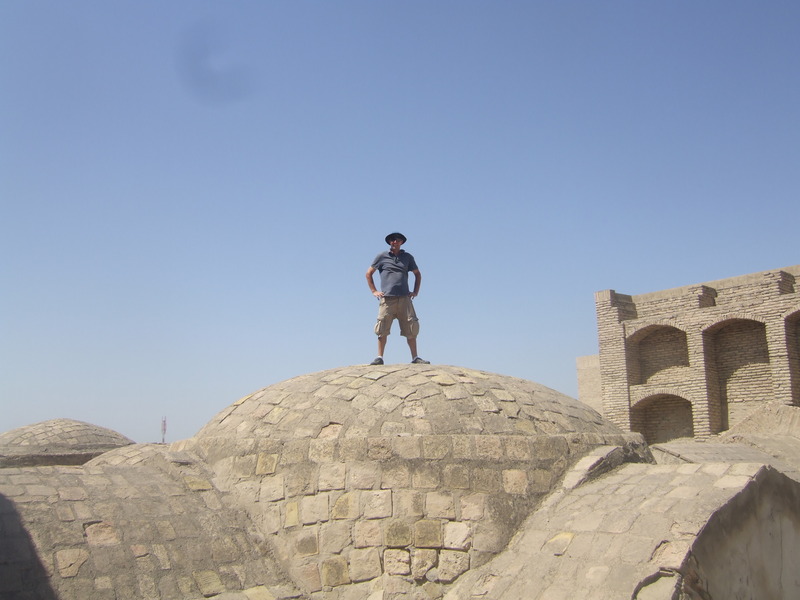 I went back to Madina and Illos guest house and got a spot on the roof. It was good to see my bike again and after sitting around for a week it was very dusty so I gave it a good clean straight away. nuts and pasta for the 5-day cycle down to Dushanbe. We found some scales in the market, so I weighed myself – 75kg………..was 83kg when I left London. 8kg lost after 8500km. After a Spanish siesta in the afternoon we met up again in the evening and went for a nice walk to find the four minorets which were tucked away amongst some houses in the old town. 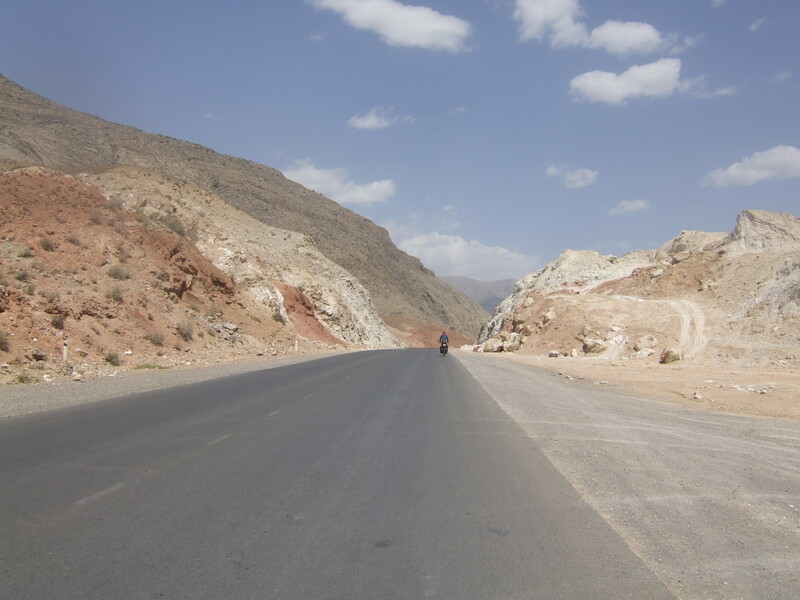 On the way to Bukhara I got a puncture……………….found two holes and repaired them on the side of the road. Frustratingly after pumping the front tyre up yesterday, this morning it was flat as a pancake. So during breakfast I took the tube out and found another hole. Fixed it and then gave the bike a good going over tightening all the racks and panniers. Loaded the bike up getting it all ready for tomorrow. Embarrassingly I still have a slow puncture in the back tyre which I have had since Turkey and need to pump up every two days………..should have really fixed it by now. Maybe tomorrow – “Manana Manana”. Hanging out with the Spanish girls………a bit of Spanish is starting to rub off on me. 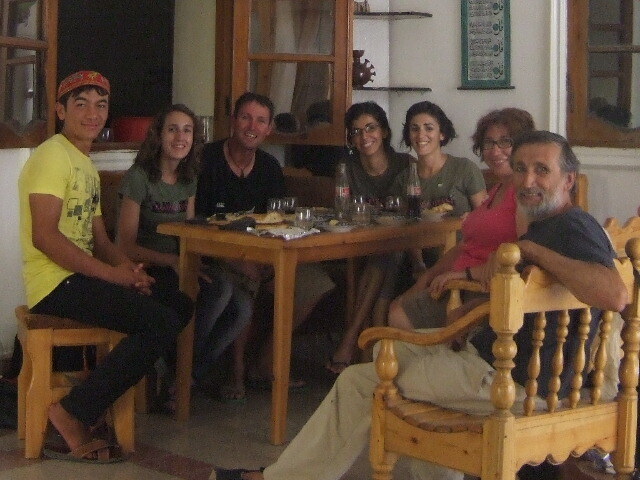 It was Amanda’s birthday today and the Spanish girls invited me for lunch at their guest house. 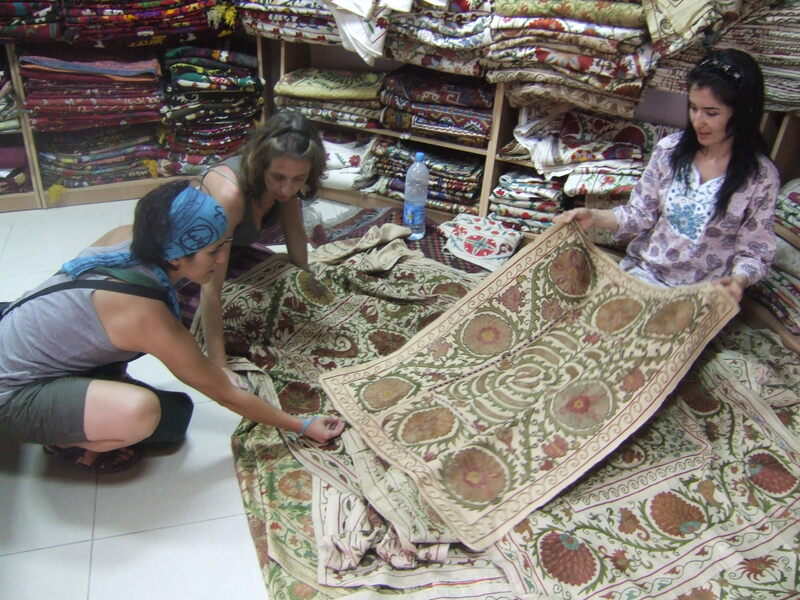 In the morning they went to the bazaar for all the ingredients for a Spanish omelette……….it was great. I gave Amanda a small silver fern from New Zealand as a present and it brought a tear to her eyes. I think she felt very humble as I did as well. Amanda is a fanatical All Black fan and watches all the games and was surprisingly knowledgeable for someone from Spain where I wouldn’t think rugby is very big. After spending the whole afternoon eating and chatting in the guest house we went out to a regular restaurant for some tea. Surprisingly I bumped into Nino and his mum who were having dinner with another half dozen of cyclists which included the Normand family who are from France and have been cycling round the world with their young children for the last year and a half. Last night I slept on the roof of Medina and Eallos guest house with a Dutch guy, a French guy and a guy from Switzerland…………….tonight it wasn’t to be. Just as we were finishing up a guy staying at the hostel came up and told me there was a problem at the guest house and that I needed to go back and get my stuff….because the police were there and had closed the guest house down because they hadn’t been paying their taxes. It’s funny because they are in the lonely planet. The Spanish girls were lovely and said I could stay with them in their guest house………….beats sleeping with 3 guys any time. We all went back to my guest house and collected my bike. The police had left and credit to the guest house they gave me my money back. 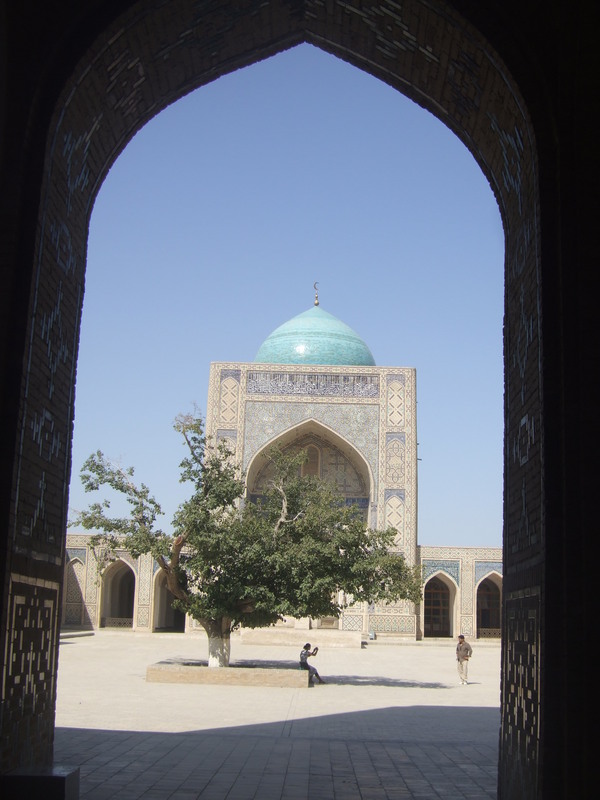 Finally got away this morning from Bukhara after 14 consecutive cycle free days, which included 2 extra nights in Bukhara. I had planned to leave Monday. I am cycling again with Reuben who has caught up with me after all my extra nights since we last cycled together in Turkey. 7am in the morning we passed a guy pushing a pram full of beer. He was very keen to sell me some. After 2 weeks off the bike, it was an okay day of cycling. Hot as usual. Close to 40 degrees. But the road was flat (a little rough) and we had a slight tail wind. We stopped for lunch at midday after 90 km. 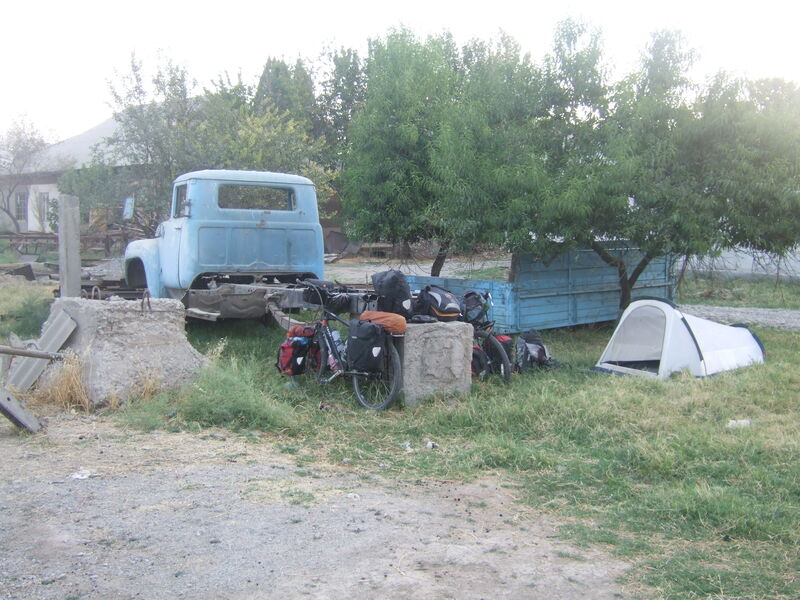 After 127 km we asked if we could camp in someone’s front yard under the apricot trees We had some company with 3 dogs, scrub turkeys and a herd of sheep. Stopped for lunch at 76 km. Had a bowl of noddle soup, some bread and a pot of tea for a euro. Then slept the rest of the afternoon on the chaptan. That was until a drunk guy tried to take my sunglasses off my head while I was sleeping. I got them back. But they then annoyed us for the rest of the afternoon. It was just to hot to leave…….so we had to put up with it. Just after lunch I cracked the 9000 km mark. I’m very happy with the performance of the bike having had no real major problems. Camped on the side of the road and half-way through cooking dinner I ran out of gas. A bit of a school boy error………..I knew I was running low and tried to push it just that one day too far. I had to eat half cooked (very crunchy) pasta and raw onion. 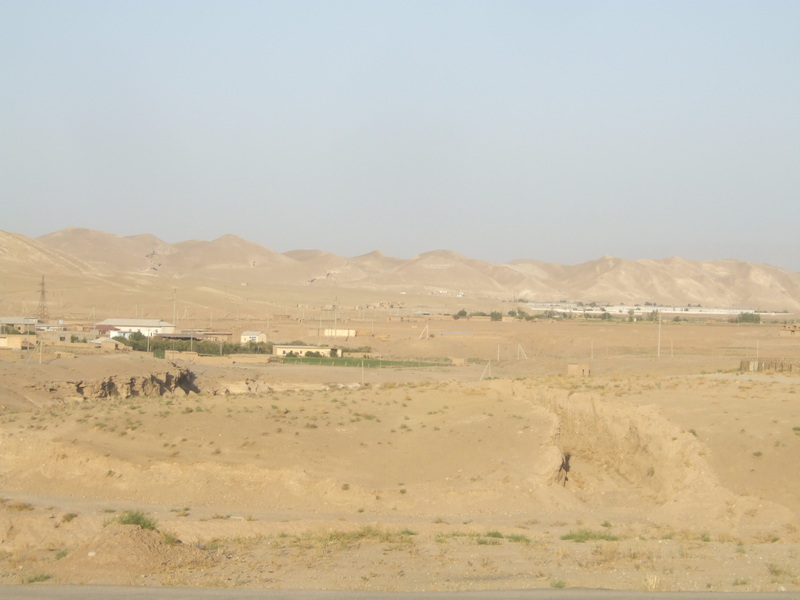 After having had it easy for the past two days, today was very up and down as we continued towards the Tajikistan border. We were stopped for the first time at a police checkpoint. Every other time we were waved through. We camped off the road and behind some sand dunes. Had some wild dogs come over and bark at us. Three days without a shower feeling dirty. Started the morning with some fried eggs to help get us going. The road was bad so even though it was downhill, it was still slow going. We pushed on all day and finally stopped at 3 o’clock for some lunch. We were starving……they made the Samsas and we ate them. We had a couple of hours rest and then went again to try and get as close as possible to the border. In the end we decided to stop at a resturant for dinner. rather than cook. Some guys next to us brought us some coke. When we were leaving the security guy asked us where we were going to sleep. He said we could camp behind some old buildings in an old yard. So we did. Camped behind the restaurant in a yard full of old machinery. Last night we camped just 12 km from the border. If I had known it was going to take 3 hours to cross this morning, I would have pushed a little harder to get over the day before. Reuben and I were up and gone by 6:30 am and 7 am we were on the border. We filled out the exit form, but still had to wait till 8 am for the border to open properly. We had to take all our bags off the bike and bring them in to the customs hall. The x-ray machine wasn’t working so we then had to take everything out of the bags. Rueben was in front and started to get a bit stroppy with the customs office and constantly made smart comments…………who then asked what’s the matter. I wasn’t impressed at all when I heard that. I sure won’t be crossing another border with Reuben because I don’t need any of that hassle. If he carrys on like that again he is going to come unstuck and I don’t want to be next to him when he does. 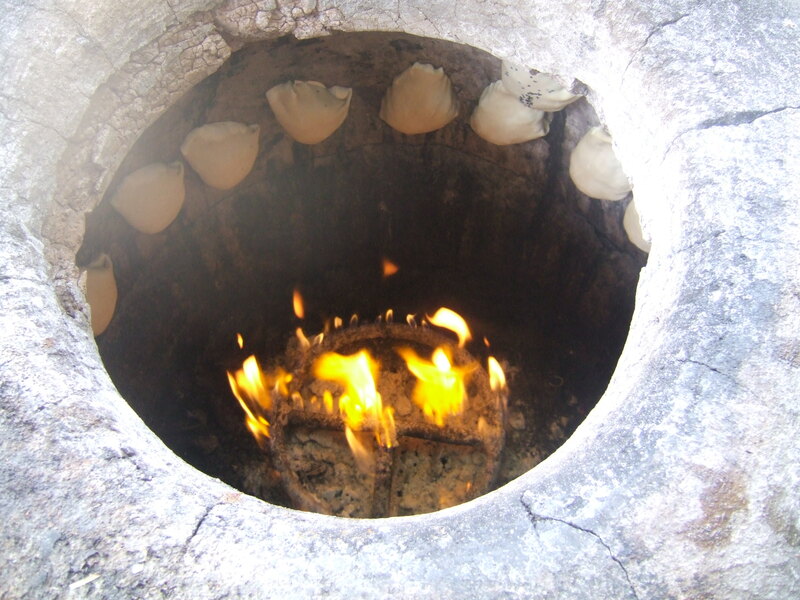 There were two lots of forms for Tajikistan which took time. It’s not made any easier for the tourist when they are only in Russian. 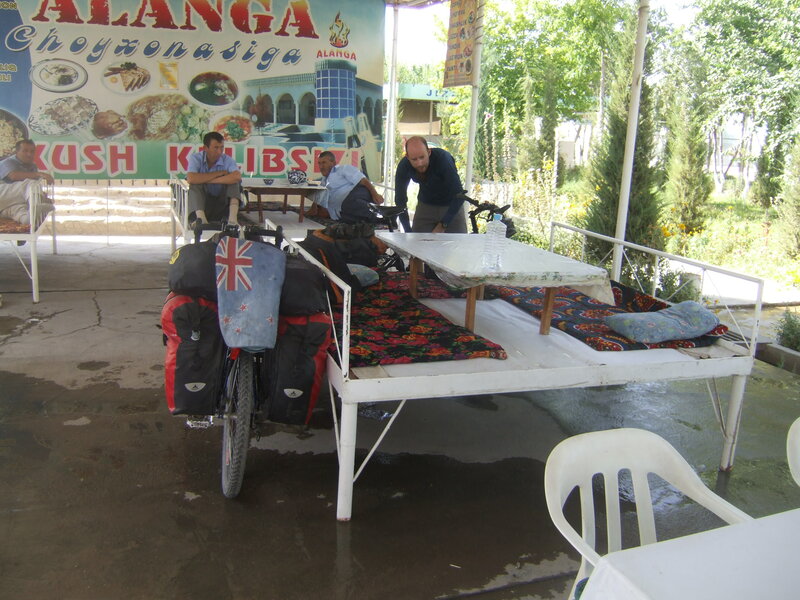 After the border it was a 66 km ride up to Dushanbe. On the way we passed the 3rd largest aluminium plant in the world. It was bellowing out what looked to be a horrible green toxic smoke. 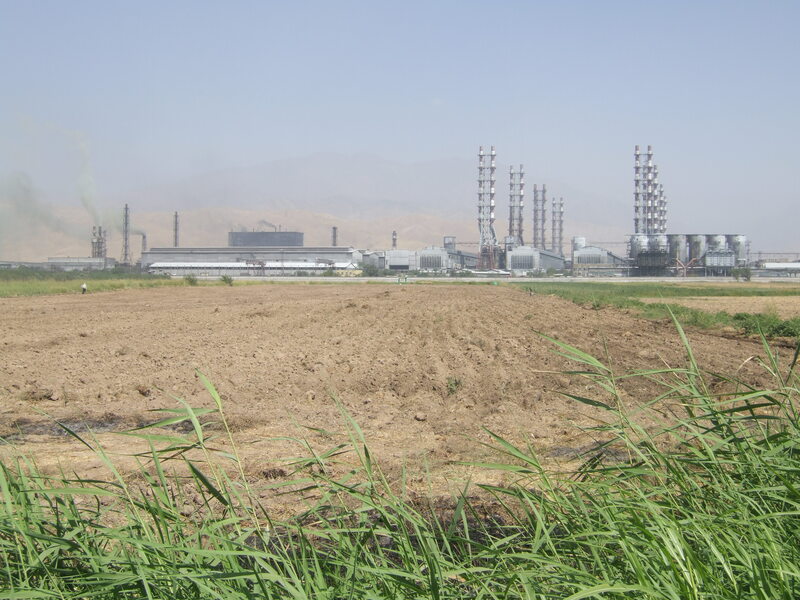 The ride into Dushanbe was 50 degrees. Accommodation is not great. We ended up getting a room in the old Soviet hotel. It is massive and a real $%^ hole. For 20.00 us$ each no shower or toilet in the room and we had to share with one other person. 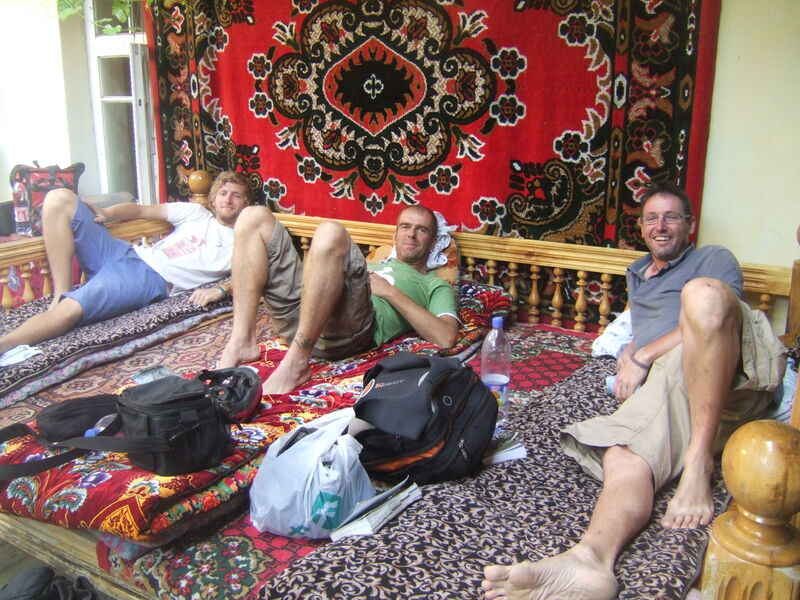 Luckily for us the guy we shared with was a Dutch guy Albert I had met in Samarkand so it was ok. Tourists pay 89 sum each while the locals pay just 32 sum. Dushanbe is a more westernised than the other Stans with lots more shops and fast-food restaurants and finally a half decent supermarket. Congratulations on your progress! I very much enjoyed reading your blog. 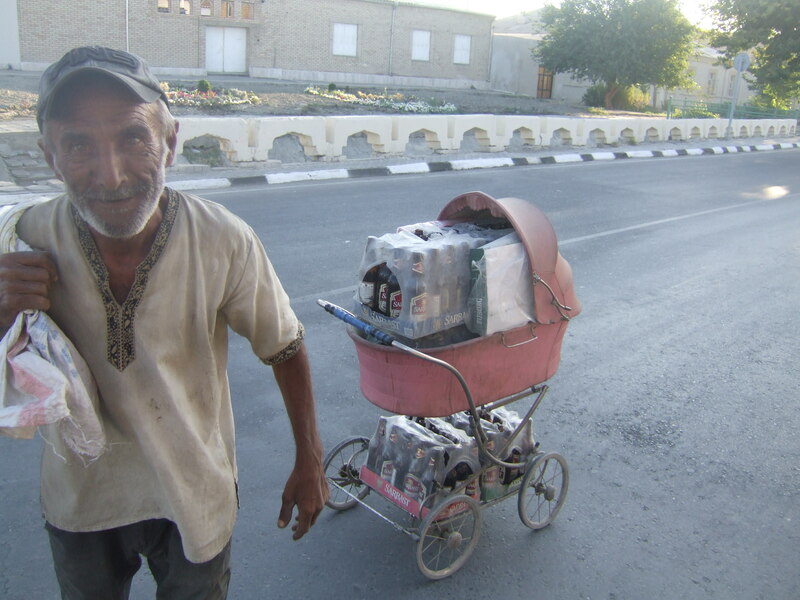 César and I have returned to Spain after our travels around Uzbekistan. In the end I think that Khiva was out favourite place. Hi Adam, I`m Amanda, one of the spanish girls. I remind a lot from you. Congratulations for the rugby world cup 2011, I enjoyed so much.